Forgive the missing logos on some. They would not load this morning. Only one team remains undefeated in the AFC and, perhaps not coincidentally, it's the team with the easiest strength of schedule thus far: Reed's Sawtooths. But, with Reed's poor luck last year, it's about time he caught a break. Previous number-one Zerger fell to second after his Redlegs lost to the last place Vultures. Three (!) teams are undefeated in the NFC, but two of them play each other in Week Four (Arrogant Americans and SoonerJack) while number-two Morgan's Whackers play fourth-ranked Lucky Enuf. It'll be a college football-style "Separation Sunday" next week for sure. The PFC, like the AFC, boasts just one undefeated team . . . and it's the team with, by far, the easiest schedule of the entire OIL. Meanwhile, Mitchell continues to have a Nightmare of a season, falling to 0-3. In between the two extremes lies a very balanced conference with no clear favorite at this point. EAU CLAIRE — Hangovers manager Adam Duffy unveiled a new team logo Sunday, seven years after first unveiling the Packers-inspired logo created at 48hoursdesign.com. The new logo does not replace the traditional Hangovers logo, but it adds to the ever-growing library of OIL logos. 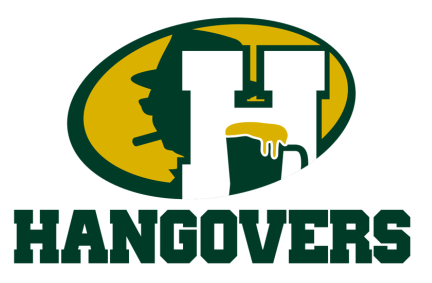 The biggest difference between the primary and new alternate logo is that, rather than using the stylized 'H' that has come to be known as distinctly Hangover, the new mark incorporates the 'G' made famous by Duffy's beloved Green Bay Packers. Both Hangovers logos incorporate the shadow of Vince Lombardi. Once again, it was a low-scoring week. The NFL better get its offenses in gear or no one will be able to break Zerger's 2016 record for most points in a season. Speaking of Zerger, his Redlegs lead the pack in the AFC and the OIL as a whole at 2-0 and averaging 156.35 points per game. Reed's Sawtooths are number two in the AFC, but they've benefited from an easy schedule . . . opponents have averaged less than 100 points per game. Meanwhile, Brosh is in last place, as he's faced the toughest schedule thus far . . . but he's also scored the second-fewest points in the AFC. That's not a good combo. ​Four teams are undefeated in the NFC, with Cliburn's Arrogant Americans (fresh off their 101st career victory) setting the standard at 2-0 and averaging 149.95 points per game. Morgan, Bruesch, and Leal round out the top four. Duffy and Pyle would be in the playoffs if the season ended today, as they sit at fifth and sixth, respectively. Cobb, whose Dogs of War were awarded the "Best Draft" by Yahoo!​, now sits at 0-2, averaging less than 100 points per game. Pathetic. The PFC, like the AFC, boasts just a pair of 2-0 teams: Gray and Tadlock. But the next four teams, at 1-1, could easily end up surpassing them soon. This conference may be the most balanced so far. Mitchell is having a nightmare of a season thus far, as he has lost his first two games and averages just 123.05 points per game. That's not gonna do it.